The Big Six is a humbucker sized true single coil pickup. It is, very simply, a Strat coil in custom clothing, wound to customer specs. It is the best qualities of a handwound single coil in a custom, humbucker package. Work with me to chose your magnet and your wind. 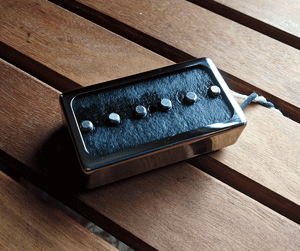 The result is a beautiful single coil tone for your humbucker routed guitar. The Big Six is always a custom creation depending on your guitar and the position. Please contact me before or after buying it. Jesse is an absolute pro. He worked with me to get the exact tone I was looking for and exceeded all expectation. Anyone who knows Revel’s name knows the work is impeccable.